Posted on Tue, Jan 10, 2012 : 3:09 p.m.
My life flashed before my eyes. And I almost spilled my coffee. A pedestrian crosses Plymouth Road. 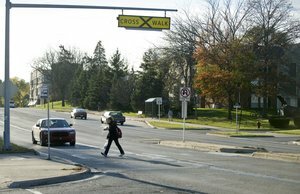 Plymouth is among the streets being targeted by the city of Ann Arbor for improved pedestrian safety measures. Ann Arbor’s concerns about pedestrian safety became real to me this afternoon as I was scooped up, literally, by a white car making a right-on-red at the corner of East Liberty Street and Fourth Avenue. I was walking along, enjoying every sip-step-sip of my Starbucks Raspberry White Mocha and the beautiful sunshine before returning to work, when my daydreams were interrupted by an awkward quickstep with a car. The quickstep, which I assure you is an accurate description (I watch "Dancing with the Stars"), was slightly violating, considering I did not consent to the dance. I was about two feet in the roadway when the driver of the car began inching slowly forward and I was forced to quick-quick-slow, quick-quick-slow sideways out of the vehicle’s turn path. Cheryl Burke and Gilles Marini perform the quickstep on a past season of "Dancing with the Stars." I had my hand on the hood of the car, trying to avoid losing my balance, as I attempted to make eye contact with the driver and to juggle my coffee and laptop bag. But the driver was too busy looking north down South Fourth Avenue to notice little ol’ me. By the time we finally, albeit briefly, locked stares, I was resting on the hood of her car with my left tippy-toe on the pavement (“sloppy” would be Len Goodman’s critique). Our expressions, the driver’s and mine, mirrored one another: She was as shocked to see me as I was to be sitting on her car. I gave a wobbly, incredulous “ta-da!” type gesture and motioned to the pedestrian crossing sign, which clearly stated that I was not so lost in my daydreams that I should not have been in the crosswalk. Having moved to Ann Arbor only about a month ago, I previously thought the city’s two-legged commuters were a bit on the whiny side. Near-death experiences walking to work? Pssch. Those people were obviously not obeying the crosswalks! But a series of events has since changed my mind. First, two men in wheelchairs have been hit since I joined AnnArbor.com. (If we won’t stop for them, whom will we stop for?) Second, I was nearly run down by a bicyclist last week in a similar scenario at South Fifth Avenue and East Liberty Street, when the cyclist blew through a stop sign while the cars around him obeyed it. And now today’s incident. In Grand Rapids, the bicyclist is fighting for his right to share the road. In Ann Arbor, apparently, the coffee-sipping, minding-my-own-business pedestrian must take a stand. Do you have a near-death experience in a crosswalk you’d like to share? Fri, Jan 13, 2012 : 2:09 a.m.
Right-on-red has always been brutal for pedestrians and cyclists. It causes drivers to look exactly the opposite direction from where they are going. Drivers also stop right in the middle of the crosswalks to prepare for their turn. Just make the entire city &quot;no turn on red&quot; and things will get better for pedestrians. If it's enforced, that is! Cyclists are supposed to obey the SAME laws as motor vehicles in the state of Michigan. Fri, Jan 13, 2012 : 2:07 a.m. This is silly. There is a problem with a lack of suitable pedestrian crossings on major thorough fares in the City. So rather than address the real problem, they pass an ordnance that is not very well thought out. In fact, it ends up causing injuries and thousands of dollars in property damage. Does the City fix the problem? No, they actually make it worse. Hey hers a thought. Let's fix the problem. The problem is no suitable pedestrian crossings. So take some of that extra money and create some pedestrian crossing above or below the roadway. Gee, didn't they do that years ago over I-94? Wed, Jan 11, 2012 : 8:51 p.m. I'm very glad that Ms. Arndt survived those incidents she describes. I think it's clear: we, as a community are a long way from having a good attitude toward others when we're out and about - whether using feet, bicycle or motor vehicle. The primary drive seems to be to attain complete obliviousness when we're outside our own homes (where we're undoubtedly continuing our focus on &quot;what's most important to me&quot;). All the cross-blaming on this forum is the proof of that. I'd LOVE to see improvement in this matter but that requires thousands of people with similar but at the same time &quot;individualized&quot; interests all deciding to take some responsibility for their attitude and behavior. Lotsa luck on that one. Wed, Jan 11, 2012 : 8:30 p.m.
For the love of all that's holy PLEASE add push button crossing lights like Brighton has for the crosswalks. Just standing there or jumping into oncoming traffic and hoping cars will see a crosser &amp; stop is a HORRIBLE and unsafe idea. No one knows what to do at the regular crosswalks. Install the pushbuttons now. Wed, Jan 11, 2012 : 7:47 p.m. I frequently wish I carried an aluminum bat while crossing at Geddes/Washtenaw/N. University. All too often drivers turn right while pedestrians are in the crosswalk, and if you are close enough for me to kick your car door, you know you did not wait for me to cross before you turned right in front of me. Cyclists blowing through 4-way stops and stop signs are nothing new, and I would gladly throw a crowbar through their spokes if I thought it would teach them anything. I do ride my bike from April - October, and I DO follow proper rules of the road. When i berated one cyclist (who was covered in spandex and had a helmet, so he wasn't exactly a typical student scofflaw) for running a 4 way stop, he had the gall to turn around and argue with me while a cop sat in the parking lot. For those drivers that think that it doesn't matter if the light has turned red long before you enter the intersection... Yellow means slow down and prepare to stop, not speed up and hope you beat the light. If the police want to make some ticket quotas, hang out on Stadium and St. Francis. Basically, you have to walk and drive defensively. Too many people think only of themselves and believe that they are more important than anyone else. Wed, Jan 11, 2012 : 6:50 p.m.
Perhaps there are two parts to walking and driving in an urban area. Following all the traffic control signals is one thing. Making sure you are watching out for your safety (and others) is another. Wed, Jan 11, 2012 : 6:05 p.m. Typical Ann Arbor; blame the pedestian/victim. She was walking with the walk sign, paying attention, while carrying coffee. How is she to blame ???? Wed, Jan 11, 2012 : 6:48 p.m.
How is that &quot;typical Ann Arbor&quot; ? I would say the majority here have concluded the driver was at fault. But Deletedcomment above does have a point that I myself follow. I do what he suggests. Even when the signals are all lit and the chance to cross is there, I look to see what others are doing. This is because I have been schmushed a couple times by people to run lights and do not see me, my brake lights etc. I would rather check further and be a little irked than rolled up in to a ball by a car and shoved into an ambulance. Wed, Jan 11, 2012 : 6:08 p.m.
She specifically says she wasn't paying attention. She was &quot;daydreaming&quot;. Wed, Jan 11, 2012 : 5:44 p.m.
Situational awareness, get some. If you checked and saw the driver was not looking in your direction then you should have never stepped in front of the car. Green cross signal or not you were in the wrong just as much as the driver. A few days ago my son and I were attempting to cross Detroit Street in front of Zingerman's after I picked him at daycare and bought him a cookie at Zingerman's next door. We attempted to cross at what remains of the white crosswalk at Detroit Street and Kingsley. As we stepped off the curb holding hands, a hulking white Mercedes zoomed past, narrowly missing my 4 year old son by inches! As I looked on, the driver also ignored the stop sign and made a right onto Kingsley squealing his tires. Imagine if this driver had done this during a crowded Farmer's market day? I have to agree with OLDTIMER3. Whom ever is on the streets / roads by any means must pay attention. It's because the roadways are shared we need to look out for each other. As much as the driver of a car has more responsibility the others sharing the roads really have as much. This description of the near mises sounds like we should begin licensing pedistrians? Maybe we do all ready? Children are sent to safety town classes pretty early. Maybe we need re-enforcement classes. Wed, Jan 11, 2012 : 3:45 p.m.
What I get from your article is, you are new to Ann Arbor, new to the paper? and have discovered that writing a piece about crossing the street will get you a lot of comments and hits, do you get bonuses for that? brownie points? daydreaming while doing anything, whether it is walking, driving or cooking can be dangerous. Keep you daydreams to when you are not doing something that would put you or others in danger. Some drivers will not look, others will look and not see you for some reason, learn to do what most people learned as children, pay attention and look both ways, I for one look to make sure people turning have noticed me, more often than not they have, some do at the last moment and have a scared look on their face. It happens. Not that many people are hit downtown. The wheelchaid man hit at liberty and fifth isn't a normal occurance. The other wheel chair man at liberty and maple was crossing against the light. this isn't about an ordinance or about a rash of pedestrian hits or near hits, it's about people not paying attention and using common sense from all sides. That means for pedestrians using crosswalks (not jaywalking) waiting for a walk signal and for drivers to look out for pedestrians, everyone without distractions of phones or earplugs in. and I agree with others, the students crossing by the union are a nightmare, totally oblivious to cars, jaywalking (while on phones or listening to music) and that three way stop in front of the union is the worst on campus intersection. THere should be a full light there, walk signals and ticketing jaywalkers for impeding traffic. Wed, Jan 11, 2012 : 3:30 p.m. This has been a great discussion starter, thank you Danielle! It was the single topic of last night's dinner. I realize you've gotten a lot of flak (yes people that usage is correct) about it, mostly &quot;don't trust the rules, look out for yourself more!&quot; On the other hand, let's not forget that the driver was completely in the wrong and should be ticketed, big-time. Did anybody get a license plate number? Has anybody come forward as a witness ... or has the driver made contact? This is the kind of thing that makes me support the idea of intersection cameras, for this particular purpose. Wed, Jan 11, 2012 : 3:13 p.m. I've seen situations where either party was &quot;at fault.&quot; So instead of being self-rightous, and putting one's self above all else, why don't people use common sense and pay attention to their surroundings? Does it really matter if you have the right of way when you get hit by a car and laying in a hospital? C'mon, already. Wed, Jan 11, 2012 : 2:37 p.m.
From a VERY old Burma Shave road sign: Here lies the body of William J. Who died maintaining his right of way. He was right - dead right - as he cruised along But he's just as dead as if he'd been wrong. Wed, Jan 11, 2012 : 2:50 p.m.
From an old Mad Magazine song parody: Hey run me over, All over town, See every chauffeur, Try to knock me down, Streets are for people, Thats what people say, I figure that means a pedestrian should have the right of way, But you can die being right, man, Wrong people thrive, Stay out of sight man and you may survive, So if you want to live in security avoiding violent shock, Just don't ever, leave, your block. Wed, Jan 11, 2012 : 2:36 p.m. I was recently in A2 in the evening and circled a block several times while waiting for my wife to make a run-in purchase. I made several right-on-red turns with only one incident. I was halfway through the crosswalk when a runner shot into the street and nearly ran into the right side of my car. I stopped and received a dirty look as the runner dodged around the front of my vehicle and continued running. That person was not in sight when I turned but she appeared to think (from her expression) that it was my fault. On a related note, I agree with the impressions of other posters that many people walking at night wear all dark clothes and make no attempt to improve their visibility for safety. Wed, Jan 11, 2012 : 1:58 p.m. Wed, Jan 11, 2012 : 1:14 p.m.
@ waterdipper , the purse and all the stuff she was carrying while drinking would be distracking was my way of thinking. And she observed the car inching forward she should have waited. Being dead right isn't good. No enforcement = No laws. It's that simple - whatever the infraction, by whatever population: drivers, cyclists, pedestrians. Wed, Jan 11, 2012 : 12:59 p.m.
@ ron granger, kind of late to be looking when the car is right there don't you think?It sounds to me like both were in the wrong. Just because you have the walk light doesn't mean you don't have to look especially with this turn on red law. Wed, Jan 11, 2012 : 12:55 p.m.
DO NOT get sucked into the mind-set of the almighty Ann Arbor pedestrians. I drive and walk in Ann Arbor, so I know both sides of this story. It doesn't matter who has the right of way. If a pedestrian and a car collide, the car will win every time. The fact is there are cars out there that might not see you. Look both ways before you cross the street. We all learned this in Kindergarten, and it is still sound advice today. Wed, Jan 11, 2012 : 12:52 p.m. So this happened at the corner of Fourth and Liberty? I believe this is an actual intersection with a four-way stop light and walk/don't walk signals for pedestrians. As I understand it, the duties of drivers and pedestrians are different when there are stop lights and walk/don't walk signals are in place (as opposed to crosswalks where there are no traffic control devices in place) so attempting to tie this into the &quot;crosswalk controversy&quot; seems a bit disingenuous. Wed, Jan 11, 2012 : 5:28 a.m. Here's the poop, as any long-time resident can attest: - when you are driving, pedestrians and bicyclers are nuisances and the goal is to maneuver around or between them without actually touching them - when you're walking, it's like Dustin Hoffman in Midnight Cowboy: &quot;I'm walkin' here! !&quot; You just go whenever and wherever you want and force the cars to slow or stop. On campus you can do this by sheer numbers. The secret is to actually know where the cars are and what they are going to do without looking as though you see them at all. - if you're on a bicycle, you are target practice for everyone. No one will see you coming or even just being there. Car doors will open in front of you. Old ladies will step in front of you on sidewalks where otherwise you could go really fast. Cars will push you into potholes on the side unless you ride in the middle of your lane, and that takes foolhardiness or just being a fool. Knowing the laws and right of way will only raise your blood pressure, because no one will be following the rules. Observe and be careful. BTW, that must have been great dancing. Glad you didn't get hurt. There's lots more crazy stuff in A2, but you won't start seeing most of it until spring. Wed, Jan 11, 2012 : 3:39 a.m.
Students usually walk half way into the street from both sides. If you're driving a car and stop before entering the 'student tunnel of doom' 100+ students will overrun your car and you're now trapped. Especially on State St between Williams and Liberty. Students seem to know how to 'judge' car traffic to basically walk up to your car and brush it as you pass by. Instead of an ordinace, why not just require drivers and students to play a few rounds of the old Frogger video game. Wed, Jan 11, 2012 : 2:37 a.m.
What I said before, the last time we were here. Wed, Jan 11, 2012 : 2:34 a.m.
Hey car drivers, can't imagine what your life is like that you can't honor a Pedstrian Right Away. I usually launch a snot rocket or kick the fenders if you don't offer the basic curtesty. Wed, Jan 11, 2012 : 6:10 a.m.
You are such a nice person and do a lot toward lessening road hostilities. Wed, Jan 11, 2012 : 2:11 a.m. The problem is that pedestrians are not afraid of cars and cars are not afraid of pedestrians. I used to joke that I'll write out your license plate number in my dying blood... But that was a stupid idea. Childish. I assumed I always had the right of way depending on which side I was on. Clearly not. Wed, Jan 11, 2012 : 2:02 a.m. Wed, Jan 11, 2012 : 12:44 a.m. I knocked over a bicyclist on that same corner more years ago than I care to think about. I felt so bad I packed his bike in my car and took him to Sears (his choice) to get his wheel fixed. I don't know how it happened, since I was driving as carefully as I always do...but the man was riding on the sidewalk which I believe is not a safe thing to do. As a pedestrian, I've nearly been creamed many, many times further north on Fourth Ave on the corner at Ann and also Catherine. People blow right through the stop signs there. Wed, Jan 11, 2012 : 6:08 a.m.
Catherine and Fourth is an awful mess at rush hour. Cars, buses, pedestrians, bikes. It can take a long time for a vehicle just to cross the street, especially going west. Wed, Jan 11, 2012 : 12:36 a.m. I always gain a little weight over the holidays and have to let the belt out a notch, but I don't check in anywhere near the 2,600 pound average motor vehicle weight and I don't walk 35 MPH. Therefore, I don't go mano-a-mano with vehicles, in or out of crosswalks, with or against lights, in broad daylight or at night. Pick your battles, and live to fight (and walk) another day. Wed, Jan 11, 2012 : 12:22 a.m.
With motorcycles you have to ride like you are invisible. Obviously this applies to pedestrians as well. It isn't easy to drive in Ann Arbor as someone said. It's downright congested and the distractions to everyone don't help. I'm glad Danielle wasn't hit and I hope the driver will be more careful in the future. As for bicyclists, they NEVER obey the same laws that motor vehicles are required to obey, though they are supposed to. The just drift through red lights and stop signs like they aren't even there. Also they are a big danger to pedestrians. As a runner, I have to be hyper-vigilant about crosswalks, because I know cars may not see me approaching (because I'm so blazing fast! - heh, I kid). Even so, I had a near miss this fall, when a car approaching 7th slowed but apparently did not plan to stop for the Stop sign. The driver was looking left, apparently planning to roll through the stop and turn right; I was coming from the right and was already in the crosswalk when she approached. I yelled and was able to narrowly miss being tagged. It was pretty scary. I'm very careful about stepping into a crosswalk (while walking or running), but in this case I was already in the crosswalk when the car approached, so I'm not sure what I could've done differently. My other near miss happened some years ago, when I was walking down Liberty and a guy on a bicycle nearly ran over me at the intersection - on the sidewalk, not in the crosswalk. Tue, Jan 10, 2012 : 11:58 p.m. Yes, my wife and I we're almost hit by a cab driver, at Williams and Ashley. The driver had to stop before the intersection, then travel through it, we we're almost half way across as he zoomed right at us, he saw us but belived he had the right of way, he came within a couple feet of us as we stepped back to avoid getting hit. I wish I'd had a cup of coffee to throw at him. Wed, Jan 11, 2012 : 4:57 a.m.
Cab drivers are the worst. Sorry, this may offend a small segment of drivers and start a an off shoot of rants. but on a daily observed basis. cab drivers are absolutely the worst. Thankfully their death machines are clearly marked and easily identifiable. I knew there was a reason they are painted bright yellow. Tue, Jan 10, 2012 : 11:35 p.m. Anyone think Ms Arndt did not know this would generate lots of comments? Wed, Jan 11, 2012 : 6:33 p.m.
She asked for comments. Problem? Tue, Jan 10, 2012 : 11:20 p.m. I almost hit a jaywalker the other day. Slammed on the brakes, spilled my beer all over my cell phone and it erased the message I was texting.. I was outraged. Wed, Jan 11, 2012 : 1:05 p.m. Reminds me of The Dude slamming into the dumpster. Thats a great movie. Wed, Jan 11, 2012 : 12:37 a.m.
Tue, Jan 10, 2012 : 11:17 p.m. The police need to enforce the crosswalk encroachment by car drivers, and the failure to yield to pedestrians in crosswalks. You know - the stuff that kills people. If you are driving a piece of heavy machinery - a car - you have an obligation to focus on operating it safely around pedestrians. I see the many comments trying to blame the victim here, trying to blame jaywalking, and excuse dangerous driving - going on about &quot;not looking out for cars&quot;, all despite the fact that the author did look for the car. It was her watching the car that allowed her to get on the hood rather than be run down. Wed, Jan 11, 2012 : 6:04 a.m. They weren't talking about the author. Obviously. Tue, Jan 10, 2012 : 10:39 p.m. The driver was wrong in this situation, but AA news is obviously biased. You will never read a story about how bad the jay-walking is in Ann Arbor. I can't tell you how many people walked in front of my car against the cross light. It happens every single time I drive downtown. Tue, Jan 10, 2012 : 11:43 p.m. When that happens to me I try to see how close I can come to the pedestrian without hitting them. Tue, Jan 10, 2012 : 10:55 p.m.
Yep. Right from the mayor/council talking points. Pedestrians - good. Motorists - bad. I walk, bike and drive all around town and have found that if you pay attention you usually do fine. When it comes to human-vehicle interactions I am more worried about physics than right-of-way. Tue, Jan 10, 2012 : 10:04 p.m. I do a lot of walking around town. With one or two dogs usually. I've had three near misses at Washington and Fourth Ave. Each time I was in the crosswalk, once a driver was running the red, twice drivers turned left into me. I had one driver apologize for turning into my dog and me at Fourth and Catherine, she yelled that you can't see people in the cross walk once you are moving. That didn't make sense to me but at least she realized she nearly hit us. The scariest is the cars that blow the stop light for the new Hawk signal. That has happened at least four times to me. One driver who really did come close to hitting me heard me scream, and gave me the finger as he turned left onto Chapin, just missing us, and I certainly had the walk sign. Just yesterday someone blew the light, but luckily we were two lanes away. The police car that didn't stop for two adults and a dog stepping into the crosswalk on Broadway was interesting, but that was early in the crosswalk ordinance. We had to pull back quickly as it was clear he wasn't going to even slow down for us. We found a cop car parked near by and reported that. Since then, buses cops, and taxis have all been some of the best at stopping so pedestrians can cross. I'm a very cautious and defensive pedestrian and have also been biking Ann Arbor since the late '70s. It is more hostile out there, and the cell phone is often in evidence when drivers do stupid things that endanger me - whether I'm in a car, on a bike or walking. The hostility in particular troubles me, both as frequent comments made at AnnArbor.com as well as actions taken on the road and sidewalk. That is just dangerous to everyone, and I'd say that hostility - whether it is from or directed to pedestrian, bicyclist, or car driver, is much more dangerous than being on a phone. My dog wears a flashing light at night, and I just got some for me. Every bit of extra safety helps. Tue, Jan 10, 2012 : 10:27 p.m. I so agree Linda Diane about the hostility being the most dangerous. I am not sure why this is happening here in our fairly peaceful town, but I notice this, too, with lots of fingers given, and lots of aggressive passes and horn toots. It certainly does not help to be angry while driving, and it is usually the drivers who are and not the pedestrians. I like how the top comments all blame pedestrians. That's fantastic. Blame the people you can kill. Wed, Jan 11, 2012 : 3:02 p.m. If someone can kill me, I look our for myself and don't trust them not to do so. Tue, Jan 10, 2012 : 9:49 p.m.
Red lights and stops signs seem to have become optional for local drivers. I almost never see drivers coming to a full stop at stop signs or when making a right turn on a red light. It's pretty much inevitable that such scofflaws will threaten or injure pedestrians. My best example from today (thus far) came when I was walking south on Thayer at about 8:30 a.m. I woman in a small dark car headed west on North University drove straight through the stop sign at the intersection with Thayer, right in front of me as I entered the crosswalk. She did not even hesitate in the slightest. What was her great rush? She apparently was in a hurry to get to the red light that waited for her 100 yards ahead at South State. Why are not these basic traffic laws enforced anymore? Would AnnArbor.com please get the local authorities on the record about why they ignore the enforcement of laws so basic to the safety of our citizens? It's gotten to the point where I fear being rear-ended when I actually stop for stop signs and stop lights when driving! Tue, Jan 10, 2012 : 11:15 p.m.
We've been talking about the lack of traffic law enforcement lately, too. I've been seeing a lot of people *blowing* through red lights, not only on right turns, but going straight as well. These are people going through, not yellow, but glaringly RED lights. Monday morning ~ 7:20 AM, while driving kids to Pioneer, we were driving North on Main (near Busch's), and were in a long line waiting to turn left on Scio. The light was red, and one car went through the red light at a high rate of speed. No vehicles were hit, thankfully. Tue, Jan 10, 2012 : 9:48 p.m.
We're glad that nothing happened, other than the huge, understandable scare. Now, did you really have to specify what coffe shop you went to and what you got there? Can't we take a break from 24/7 advertisement? Did you at least give AnnArbor.com its cut for your &quot;discreet&quot; ad? Sliding ads only demerits the other points in a story. Tue, Jan 10, 2012 : 9:26 p.m.
Do any of these &quot;near death&quot; experience people do what we teach little children? That is, look both ways before crossing the street. I won't cross if their is a vehicle near by unless I get a clear acknowledgeent from the driver that I'm seen and given the right of way. It doesn't really matter who is right or wrong when a vehicle and a pedestrian collide. A little common sense and awareness of the world around you is what personal safety demands. Sounds like the author of the article was enjoying her coffee way too much and not paying attention to the enironment by the crosswalk. Tue, Jan 10, 2012 : 11:07 p.m.
&quot;Sounds like the author of the article was enjoying her coffee way too much and not paying attention to the enironment by the crosswalk.&quot; Sounds more like the driver wasn't paying attention, and since they're in charge of the deadly instrument, I put it on them to be responsible. Whatever you say about common sense, there is clear fault here. Danielle if you are a newcomer you should also be noticing the careless drivers from every aspect. If turnsignals are optional, as they appear to be in AA, and speed limits are ignored, everywhere, what makes you think a driver will pay any attention to a puny pedestrian? My near death experience happens every single time I get behind the wheel of my car. This town brings &quot;defensive driving&quot; to a new level. So, by all means be careful in those crosswalks... the knuckleheads abound. Wed, Jan 11, 2012 : 3:36 a.m.
You have seen people use turn signals in Ann Arbor? Tue, Jan 10, 2012 : 9:20 p.m.
Has anyone noticed how poorly lit the cross walks are around town especially those new ones the put in all over town? Tue, Jan 10, 2012 : 9:10 p.m. I didn't realize you could grow, pick, and roast your coffee at home. You must be very wealthy and live somewhere warm. Tue, Jan 10, 2012 : 9:28 p.m.
Tue, Jan 10, 2012 : 9:09 p.m. I like Zags's comments. All sorts of crazy and dangerous things have happened to me walking, driving a car and biking. A couple of stories: Drivers, if you think you are helping a bicyclist, who has already stopped for a stop sign, by allowing them to go, even though you have the right of way, think again. The other day, I was northbound on 4th Ave. by bike and wanted to turn west on Catherine (4-way stop). I stopped and spotted one car that was there ahead of me and waited for it to go. Apparently he thought he was being nice by allowing me to go, but by waiting, instead created confusion about whose turn it was to go. When I finally went, some of the other cars that had arrived in the meantime started moving at me in the intersection. Another time biking, turning from westbound Washington onto northbound 4th Ave., I had the right of way and everything was clear for me to go. But just enough distance around the corner that I couldn't see him was a jaywalking pedestrian--a near miss, and getting hit by me on a bike is bound to hurt. Wed, Jan 11, 2012 : 7:28 p.m. I am not even a cyclist but &quot;Amen&quot; to this. The concept and proper execution of right-of-way is something that strains the limits of the driving population's abilities to begin with; people monkeying with it can only make matters worse. Tue, Jan 10, 2012 : 9:36 p.m.
ITA. Too many times someone being &quot;nice&quot; causes a worse problem for people expecting others to just follow the rules. Tue, Jan 10, 2012 : 9:08 p.m. I have lived and worked in Ann Arbor and can't believe that pedestrians really need an ordiance to keep them safe. It is a matter of looking both ways before crossing, just like they should have been taught by their parents and how I taught my parents. Also, there are enough lights in Ann Arbor to not cross in the middle of the road away from a light. I do, and I would hope that other drivers do the same thing, us caution at lights and give the pedestrians the right-of-way at the &quot;light&quot; corners. I am sorry for you misfortune and I would have reported that driver if you were crossing at a designated light. Wed, Jan 11, 2012 : 5:50 a.m.
Granger - Was that really necessary? Wed, Jan 11, 2012 : 2:01 a.m.
Tue, Jan 10, 2012 : 11:11 p.m.
None of the scenarios you describe even remotely relate to what was reported in the article. Tue, Jan 10, 2012 : 9:03 p.m.
Well I was hit on my bicycle while in the crosswalk at Huron and Fifth, right in front of the police station. It was a near-death experience and only my bicycle received the major damage. It was a distracted driver (talking on a phone) turning left from Fifth onto Huron. I was lucky to walk away--shook up but okay. Car drivers must have the most responsibility--they are driving something that can actually kill people. Tue, Jan 10, 2012 : 10:24 p.m.
@obviouscomment: Like Pooh Bear said, Car drivers are driving something that can actually kill people. As a car driver, I prefer bikes riding on the sidewalk, even on streets with bike lane. There's always a chance that biker may fall, so it would better for everybody if that happens on the sidewalk and not on the road. As a bike rider, I don't care for drivers texting. There's no point in lecturing biker about riding on the road when you can't enforce that drivers quit texting. Anyone with decent biking experience knows that bikers are more vulnerable to poor maintenance of roads and trash cans being left on the bike lane. Tue, Jan 10, 2012 : 9:33 p.m.
You were on a bicycle in the crosswalk??? Regardless of whether the driver was distracted or not, you were in the wrong place. Sidewalks are for pedestrians, not bicyclists. Tue, Jan 10, 2012 : 8:54 p.m. I've lived here for 26 years. A couple things I've learned: !. When walking, watch out for cars and bicycles when crossing the street, regardless who has the right of way. Expect that people/ cars etc, are not going to stop. 2. When driving in the city, expect that any pedestrian or bicyclist that you see either can't see you or will ignore you regardless of who has the right of way. 3. When riding a bike in the city no one is your friend and you ride at your own peril. You need to be hyper alert! 3. Every driver out there is a worse driver than you so watch out for them too. There is no law on the books that will bring you back from the dead because you &quot;had the right of way&quot;. There is no substitute for common sense and paying attention. Wed, Jan 11, 2012 : 1:08 p.m.
That is exactly on the button. This is what I was trying to say in another post. Which I can't find today. Tue, Jan 10, 2012 : 8:49 p.m.
&quot;I was nearly run down by a bicyclist last week...when the cyclist blew through a stop sign while the cars around him obeyed it&quot; From what I've seen, cyclists are some of the worst offenders and I have yet to see one of them get a ticket. Everyone needs to slow down. Pedestrians need to look both ways, often making eye contact with the driver so both know what's going on. Wed, Jan 11, 2012 : 3:35 a.m.
Tue, Jan 10, 2012 : 8:46 p.m. I was almost hit yesterday by a delivery car heading east turning right from liberty on to state street. The walk sign was lit, and a number (5-10) of us started to walk when the delivery car decided to make a right on red on to state. While that intersection is quite busy usually, when do you ever get to make a right on red - there are *always* people crossing the street. Stupid drivers deserve tickets. I gave the car a nice kick, hopefully I left a dent to for him to remember me by. Tue, Jan 10, 2012 : 8:45 p.m. I'm so glad it turned out all right! Your writeup of the event is very vivid and amusing. Thanks for sharing it. @vicki, she probably wasn't really paying that much attention either, hurrying back to work , sipping hot coffee, carrying a laptop and a purse.here are blind spots in the drivers view also just like she didn't see the car the driver probably didn't see her. THAT IS WHAT IS WRONG WITH THIS TURN ON RED LIGHT LAW. The driver was most likely more worried about oncoming cars. There is nothing wrong with the turn on red law, there is something VERY wrong with drivers that don't look both directions. They are obviously making it too easy to get a drivers license. It should be common sense that people use a sidewalk and cross at intersections. Tue, Jan 10, 2012 : 9:13 p.m. Boy there's a LOT of presumption in this comment!! It appears to me she did see the car, but she had the right of way and it sounds like the car was stopped and then started to creep forward after she had already entered the crosswalk. And what does carrying a laptop bag (no mention of a purse) have to dom with paying attention?? Yes, one must be cautious making a right-on-red, but don't blame the victim (okay...near-victim). I think A2 has too many unnecessary &quot;do not turn on red&quot; signs. TOO MANY! And then they complain that idling is bad for the environment. Tue, Jan 10, 2012 : 8:53 p.m. I like the right turn on red. If no one is coming, then why sit there like a dumb sheep not able to make decisions. Tue, Jan 10, 2012 : 8:44 p.m.
Ms. Arndt, you are too nice and next time it may cost you more than an unpleasant dance. The next time you are slowly bumped by a car turning, assume rightly the drive does not see you at all and it about to run you down by accident. Do yourself and them a favor - either pound of the front of their hood or toss your much beloved Raspberry White Mocha onto their windshield. They will buy you another or forgive the dent. If the driver had been a quick starter, you may be dead. No one wants that, including the driver. Wed, Jan 11, 2012 : 2:44 a.m.
Ms Arndt...Please read up on road rage before following these suggestions. Better a near miss than a beating or gunshot wound. I agree. I was 16 and new to the whole driving thing when I went to make a right turn and I heard a fist bang and dent my hood getting my attention before I ran a person over. It's been 25 years since that incident and I still think about it as I make sure no one has walked in front of me while Ive been looking left and right. I've also learned to make sure to get eye contact with a driver before stepping in front of a car that has its turn signal on. Tue, Jan 10, 2012 : 9:11 p.m. I was a little too surprised to react appropriately because the driver was clearly at a stop when I stepped into the roadway. I said &quot;whoa&quot; a couple of times (not that she could hear me though) but beyond that, it took me a few seconds to fully comprehend that the driver absolutely did not see me and was going to continue turning. Tue, Jan 10, 2012 : 8:43 p.m.
You've had two near-misses in the 10 days or so? Definitely a statistical outlier and maybe not a coincidence - you need to watch where you are going! Don't depend on the other guy. Know bikes won't always stop (honestly, what did you expect?). Make eye contact with the cars that are in that right-on-red spot, and keep them in your peripheral vision. I've walked around downtown for thirty years and have never had a single near miss. Fri, Jan 13, 2012 : 11:20 p.m. I also prefer to walk/bike behind cars looking to turn, especially if not certain they were looking at me. This seems to be a forum for venting. The issue is way too serious to make fun about it. We all need to pay attention, drivers, pedestrians, and cyclists. This is obvious. Yes, I have nearly been run over, and yes, I have nearly hit someone. Neither of these are fun or funny experiences. They are serious. Can we simply go a bit slower and look around thoroughly before we progress? That sounds good to me but try to enforce &quot;common sense&quot;. It can't be done. sounds like sipping and stepping isn't the proper thing to be doing while crossing the street. pointed to crossing light, you may have been in the right but you should still be paying more attention to traffic. While driving in AA last night at 11:00 there were people crossing all over between crosswalks, some with all dark clothes on besides. They just step out without looking like they own the place. Tue, Jan 10, 2012 : 11:08 p.m.
&quot;you may have been in the right but you should still be paying more attention to traffic.&quot; It sounded like she was paying attention. Enough that she was able to climb on top of the hood rather than be flattened. Tue, Jan 10, 2012 : 8:36 p.m.
Was the green walk light on for you? Remember, in the article she said she pointed at it! Yes, it was. The little white guy was definitively glowing. Tue, Jan 10, 2012 : 8:32 p.m.
My experience has always been that in Ann Arbor (college town), students cross streets whenever and where ever they want. They don't cross at crosswalks, and expect every car to stop regardless of how far into the intersection the car might be already. Or people being dropped off at AATA stops which forces those folks to walk down the street a few hundred feet to get to the closest crosswalk, do you think they do that? Like another person commented, sorry about your experience today. But being a driver around Ann Arbor is just as unpleasant as the situation you just faced today. My dog and I have daily near-misses on sidewalks....not even in the street....by speeding bicyclists who seem to not have a care in the world for pedestrian's right of way. Aren't bicyclists supposed to be using the designated bike lanes on the streets and legally not supposed to ride on sidewalks? Wed, Jan 11, 2012 : 7:14 p.m.
And now I am imagining SAMCRO riding around on Schwinn 10 speeds. Wed, Jan 11, 2012 : 6:54 p.m.
i think bikers are in a world of their own. by this i mean they do not stop at stop signs. they feel they can just ride up to the front of a light. example. on stadium turning left on jackson. you have three lanes. left, straight and right turns. the other day a biker came up to the front and turned left with the car turning at the same time. i am sorry bikers have to be treated like a car. follow the laws. i am sure i will hear from a lot of bikers but sorry it is true. they come first cars come second. Wed, Jan 11, 2012 : 6:21 p.m.
Tue, Jan 10, 2012 : 9:53 p.m.
Tue, Jan 10, 2012 : 9:15 p.m.
Too bad ann arbor doesn't have the man power to enforce some rules with the ignorant bicycle riders in this town...the way I look at it is if you want to ride your bicycle in the road then you must obey the rules of the road ie stopping a intersections and red lights. Tue, Jan 10, 2012 : 8:30 p.m.
My 32 year driving and walking experience finds a lot more jaywalkers crossing the road where they shouldn't forcing vehicles to stop where they shouldn't have to than the other way around. Especially the closer to campus you get. Then why bring up jaywalkers at all if not to somehow try to justify bad behavior on drivers' parts? The article was about a lady crossing legally and a driver illegally hitting her. That you're trying to shift the blame to jaywalkers is ridiculous. Wed, Jan 11, 2012 : 1:11 p.m.
Pete, I agree there are more ways a driver can break the law. But to the idea of &quot;near death experiences&quot; it pretty much comes down to who has the right of way. Did the driver ignore the pedestrians right of way or did the pedestrian ignore the drivers right of way? I never suggested jaywalking outnumbered the &quot;myriad ways drivers break the law.&quot; You created a straw-man argument. The author asked at the end of her story...... &quot;Do you have a near-death experience in a crosswalk you'd like to share?&quot; I am merely pointing out in my experience I have had hundreds (yes hundreds) of &quot;near death experiences&quot; where a car could have struck and killed a pedestrian. A vast majority of those experiences were outside of crosswalks. So I contend Todd, my point does have some slight relevance to the story. But to her immediate point when I am the pedestrian I never assume my right of way unless I make eye contact with the driver/drivers stopped at the crosswalk. Wed, Jan 11, 2012 : 2:35 a.m. I'm sorry, Craig, is this meant as an explanation of why the author was nearly run down while crossing at a crosswalk? Does that fact that people jaywalk near campus mean that it's OK for drivers to ignore stop signs and stop lights and run people over? Just what what point are you making that has the slightest relevance to this story? Tue, Jan 10, 2012 : 11:02 p.m.
You have to be kidding me. The only thing a pedestrian can do illegally is jaywalk, there are SO many things drivers can do illegally to endanger pedestrians. There is simply no way, given the number of drivers, that jaywalking outnumbers the myriad ways drivers break the law. I'll make you a deal. If you don't drink coffee while you're crossing the street, I won't text when I drive. It is a two way street, after all. Wed, Jan 11, 2012 : 7:05 p.m.
A more phony comparison I have yet to see; comparing drinking coffee to texting is just plain absurd and anyone who has performed either action would know it. Now if the pedestrian herself had been texting, that would be blameworthy. Wed, Jan 11, 2012 : 12:12 a.m.
Tue, Jan 10, 2012 : 10:53 p.m. I think her &quot;daydreaming&quot; was a bigger issue than her &quot;coffee sipping&quot;. Obviously, the driver making a right on red is at fault, although I doubt that would be a consolation if she never awoke from her daydream. Based on the description in the article, the driver was trying to make a right-on-red after the writer had already stepped into the crosswalk - presumably with a green light in her direction, giving her the right of way. I don't see her coffee-sipping as she crossed as part of the problem (although it could have been if she wasn't also paying attention). I venture to say, if it had been, she probably would have wound up being bumped to the ground, as she would not have notice the car invading her right of way. Unlike texting, you can sip coffee and keep your eyes on where you're walking. Tue, Jan 10, 2012 : 8:34 p.m.
this is a ridiculous response. the woman was on top of the car's hood! where was she at fault?! Tue, Jan 10, 2012 : 8:20 p.m.
&quot;Do you have a near-death experience in a crosswalk you'd like to share?&quot; Sort of...yesterday while driving downtown I almost hit a pedestrian crossing the street (not in a crosswalk) because they were too lazy to literally walk 10-20 feet to the crosswalk in front of me. While I sympathize with your near-death experience and agree that the driver was completely at fault, I still feel that my own experiences (of walking and driving in Ann Arbor) show that most of the issues are caused by careless pedestrians expecting everyone to stop for them no matter what and not being patient enough to look both ways before crossing the street. No matter what the ordinance states, stepping into a crosswalk anywhere without looking both ways and waiting for traffic is an irresponsible and reckless decision on anyone's part and if I ever get pulled over at one of the crosswalks that has a sign reading &quot;stop for pedestrians WITHIN crosswalk&quot; I will definitely fight it because it's ridiculous that they would make an ordinance and then put up incorrect signs and expect people to just know. Wed, Jan 11, 2012 : 11:18 p.m. Wed, Jan 11, 2012 : 5:15 a.m.
Sunk - Did you not read what she wrote? She wasn't talking about people walking within a crosswalk, but without it. Further, she was simple talking common sense. Tue, Jan 10, 2012 : 10:51 p.m.
&quot;stop for pedestrians WITHIN crosswalk&quot; is a state law and not local, the local ordinance is stopping at a crosswalk when someone is approaching the crosswalk. I doubt you'd win your battle, since ignorance to the law doesn't really excuse you of it. And what if that pedestrian had a white and red cane? I just don't understand the issue, if I'm driving the speed limit I can stop quite easily. If someone is tailgating you, that doesn't really seem like a valid reason to remove a pedestrian safety law, it seems more like it should be a call to action to local police to enforce tailgating/speeding laws. Wed, Jan 11, 2012 : 6:24 p.m.
Tue, Jan 10, 2012 : 11:18 p.m.
Just do what the UM students do, walk out in front of us. Never get across on State will you.